Contrast sensitivity refers to your ability to distinguish individual objects from things in the background. If you have high contrast sensitivity, you will be able to see objects even when they are outlined poorly and are very similar to their background, for example, a white piece of paper on a white tablecloth. If you have low contrast sensitivity, objects will appear to blend into the background, and you may have difficulty with many common tasks such as driving at night, seeing spots on clothes or dishes, and reading facial expressions. You also may have trouble reading or require extra light to do so, and your eyes may feel tired when watching television. Contrast sensitivity is an important measurement of how well you see in real-world conditions. The Snellen eye chart typically used for visual acuity testing represents the best case scenario for contrast: reading black letters off a white background, but the world around us is rarely so well defined. Even if you have 20/20 vision, you will have difficulty seeing things clearly if you have low contrast sensitivity. Objects will appear to blend into the background, and everything will look a bit faded, like an old photograph. The procedure for contrast sensitivity testing is similar to testing visual acuity, in that you will be asked to look at a chart to determine how well you can see. But unlike the Snellen eye chart, where the letters gradually get smaller, on a contrast sensitivity chart the objects (which may be dots, bars, or letters) gradually get more similar to the background. You will indicate which objects you can see clearly, and where you are unable to distinguish anything. Typically you will use both eyes at the same time for contrast sensitivity testing, though if an eye disease is suspected, such as glaucoma, cataracts, or diabetic retinopathy, each eye may be tested separately. 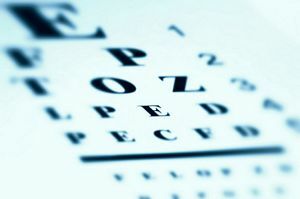 Your vision may also be tested under different conditions, such as in bright light, in dim light, or with glare. Once this process is complete, your eye doctor will take your test readings and use them to form a graph, the curve of which will show him or her how well you can see contrast. There are several causes for low contrast sensitivity, and different treatments available. One common solution is special yellow-tinted lenses to improve contrast and give you better vision. If your low contrast sensitivity is caused by higher-order aberrations, Wavefront lenses might be a solution for you. The Wavefront system creates a unique map of your eye, allowing special eyeglass lenses to be made to counteract these problems. Higher-order aberrations are visual distortions which can be caused by imperfections in the surface of the cornea or natural lens, scarring, dry eyes, large pupils, or trauma. They can also be a side-effect of LASIK and other refractive surgeries. In addition to low contrast sensitivity, higher-order aberrations can cause symptoms such as glare, halos, starbursts, blurring, and ghost images. If you are having trouble seeing things clearly and suspect you may have low contrast sensitivity, see your eye doctor for a complete evaluation.